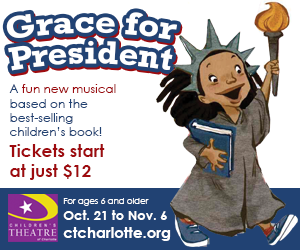 Smarties, the Children’s Theatre of Charlotte newest production, the world premiere of Grace for President, is coming to town. The timing couldn’t be any more perfect with the upcoming presidential election. If you ever wanted to teach your children about the Electoral College, government, democracy…. This is for you! If these are the book reviews, can you imagine how amazing the CTC’s performance is going to be? They are masterful on bringing stories to life. I am super excited! This is the question Grace Campbell asked her teacher as she was hanging a poster of the American Presidents on the wall. “No Girls…Who’d ever heard of such a thing…I want to run for president,” responded Grace. 1.) What would be your campaign slogan? 2.) What qualities make you a good leader? 3.) What issues are important to you? For an extra vote, create a campaign poster or submit a photo of you volunteering, recycling, helping others, being SMARTY, etc…and post it on social media using the hashtag #graceforpresident #charlottesmartypantselection and tag us @charlottesmartypants. Good luck, little smarties. We will pick a winner on Thursday, October 20th. Smarty Shopping Spree Starts Tomorrow @ Tootsies Too! There are a couple important issues that I would like to see addressed. Girls should not be judged by the way they look and feel pressure to always look pretty. People should treat poor people with more respect and help them earn money. My son says that the qualities that would make him a good leader are that he is smart, kind, and cares for other people. My daughter is 4 so the questions were a bit beyond her years. I started explaining what a president was and she asked to see pictures of what a president looks like. So I went to google and showed her Obama, George Washington, Abe Lincoln, etc. Her first response without any pushing/leading was “WHERE ARE THE GIRLS?” We’d love to see this play! “Pancakes all day every” if you vote for me! Everyone needs to be nice. Love everybody. And no hitting each other. My daughters said leaders need to be trustworthy and kind. Amen to that!